A convertible crib is a baby crib that can be transformed into one or more different types of baby beds. Therefore, they last for many years. In a simple meaning, a convertible crib is a crib that can convert. Starting as a crib, it can be changed into any form of a day bed or toddler bed, full, twin, and/or queen bed. Though adult assembly is required, it is fairly easy. Some convertible cribs come with different labels such as 4-in-1, 3-in-1, or 2-in-1. But, this labeling is confusing because of the lack of standard numbering system. Therefore, while purchasing a convertible crib, you should read the description closely. You can pick the right product from this Top 10 Best Convertible Crib without any confusion. Stork Craft Princess is a white colored, 4-in-1 convertible crib that comes with beautiful, feminine features. This is really a perfect bed for your little new girl. Solid wood and wood products are used for making this crib. Thus, it can last past the baby years of your daughter. The convertible frame of this Princess Crib allows you to convert it into a bigger bed. Stork Craft Princess starts as a baby crib, then you can convert it into a toddler bed, then to a daybed. At last, you can also convert it into a full-size bed form. This is really an elegant baby crib. Using this crib is exceptionally safe. Swooping front rail makes getting to your baby very easily. Non-toxic, healthy finish is the other major feature. You can lower mattress base into three levels as per the growth of your little princess. Stork Craft Princess offers you timeless beauty, safety, and comfort in the nursery of your new princess. DaVinci is very popular for making incredibly stylish and super sleek baby cribs. But, DaVinci Jayden 4-in-1 is one of the most impressive products of the company. A Jayden Nursery Collection can be found in almost all sophisticated nurseries. The crib is available in three different colors such as ebony, slate, and white. All these colors are extremely adorable. Each puts off a shiny finish that can sparkle across the room. Easy convertibility is one of the most important features of DaVinci Jayden 4-in-1. You can transform it into various different styles of bed. The 4 levels of mattress support are the other major feature that offers you the ability to change the height of the mattress quickly as per the growth of your child. The 4-in-1 functionality provides you the ability to transform it from a standard to a toddler bed to a full-sized bed. You can enjoy peace of mind because DaVinci Jayden 4-in-1 offers topmost safety to your child. Babyletto Hudson is a 3-in-1 convertible crib that comes with a functional, modern-looking frame, which is perfect for supporting your baby from infancy through toddlerhood. The 4 easy-to-adjust mattress levels keep up with your baby when he/she reaches each developmental milestone. The finished paint of this convertible crib is free from lead and phthalate. It will not create any harm even if your child chews the side of the crib. New Zealand pine wood is used for constructing this crib, so it is sturdier and stronger than other cribs. The Babyletto Hudson can provide a safe sleeping environment for your child for many years. Various finishes and beautiful design make it an asset to any nursery. It will definitely be the most notable furniture in the room of your child. Dream On Me Classic is the ideal convertible crib for keeping your baby entertained during playtime and comfortable during naptime. This portable folding convertible crib is engineered from solid pine wood. So, it offers years of reliable use. Dream On Me Classic can also be used as a playpen or crib. The multiple finishes of this crib allow you select the one that is perfect for the room of your child. Locking wheels allow you to move and handle this crib very easily. This is a space-saving crib, so you can fold it if it is not in use. This is non-toxic and lead-free, so it is very safe for kids and adults alike. Aden 4-in-1 is a lovely piece of furniture, which can be transitioned from a standard crib to a twin sized bet or to a toddler daybed very easily. 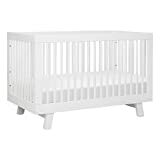 Your child can use this crib even when he/she reaches adulthood. The mattress of this crib is up to 3 levels, which offers easy height adjustments. Thus, it is more convenient for both you and your kid. The crib sits low on the floor, thus you can reach your baby very easily. The sturdy design offers extra security. Non-toxic and lead-free colors provide topmost safety to your child. 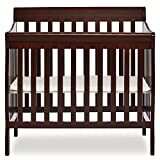 Delta Children Canton is a 4-in-1 Convertible Crib that comes with a perfect blend of safety and comfort. Engineered from sturdy and strong wood, it promises many years of reliable use. The toddler guardrail and 4 straight legs provide additional support and safety. Delta Children Canton is available in multiple finishes that allow you select one that perfectly suits the room of your child. The convertible design allows you to change it into a toddler bed, daybed, or a full-size bed. The rails for full-size bed are sold separately. Solid hardwood is used for constructing this model. A non-toxic finish offers maximum safety to your child. You can adjust the height of this crib very easily. Dream On Me Violet is a 7-in-1 convertible crib that is designed with timeless appeal. It has a beautiful flowing design, which perfectly coordinates with a wide variety of decorative styles. The transition of this 7-in-1 crib is very easy. You can convert it into a toddler bed, youth bed, daybed, or a full-size bed as per the growth of your child. An easy to use 4 position mattress is the other major feature of this bed. This support system offers additional adaptability. Dream On Me Violet comes in a range of finishes. It has the ability to change into 7 astounding types of beds, which is the most breathtaking feature of this crib. Real wood is used for manufacturing this lifestyle crib. The unique design of Dream On Me Violet is very chic and sophisticated. Stork Craft Portofino is a 4-in-1 convertible crib and changer that is designed for providing topmost comfort to your child. An adjustable, 3-position mattress support is helpful for keeping the mattress firmly in place. It offers plenty of storage space because it comes with 3 spacious drawers and 3 open shelves. You can also detach the changing table and use it as a nightstand when you convert the crib into a full-size bed. Quality pine wood and composites are used for manufacturing this crib and changer. It is available in non-toxic, safe, and multiple finishes, thus the safety of your child is guaranteed. You can use it as a crib, daybed, toddler bed, or a full-sized bed. DaVinci Kalani is a timeless nursery collection, which offers subtle charm to your child that last a lifetime. This 4-in-1 crib provides superior convertibility, which enables you to change it into a toddler bed and full-sized bed very easily. The spacious and versatile changer and dresser complement every stage of the life of your baby. DaVinci Kalani also provides you ample storage, which is enough for meeting your changing needs. 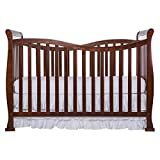 This classic nursery crib is extremely safe, reliable, and sturdy. Kalani is one of the most sought-after and reliable cribs on the market. Solid wood is used for making this crib. Thus, your child gets a stable haven year after year. DaVinci Kalani gets a special place in the homes and hearts of people because of tasteful design and gentle curbs. Graco Freeport Convertible Crib provides the ultimate value with its 4 different stages and 3 mattress heights. You can keep the mattress base at the highest level during the crib stage. The height can be lowered as your child grows. You can remove the front rail of the toddler bed when your child reaches 35 inches. Graco Freeport Convertible Crib offers a safe sleeping environment for your child. This crib is JPMA certified and tested stringently by 3rd party lab. Thus, it meets ASTM and CPSE standards. Graco Freeport Convertible Crib is affordable, stylish, and innovative. This convertible crib is crafted carefully and it is simple and functional. The practical design can provide a transitional look to your nursery. Stationary side rails offer a safe sleeping environment for your baby. 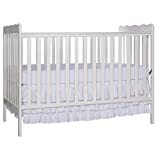 Graco Freeport Convertible Crib is the fast moving and best selling crib because of lots of amazing features. The convertible crib is a very popular option for many families because of various different reasons. But, the prominent among them is the value that is offered by this item. Convertible cribs can provide more value to the customers because they can be converted as per the growth of your child. Durability, versatility, affordability, etc are the other benefits of purchasing a convertible crib. These items also provide highest safety standards to your child. When your child becomes too big for the crib, you can convert it into a toddler bed by using a few tools. Various different convertible crib brands are available on the market. 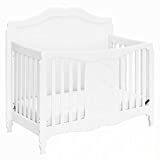 But, you can make a purchasing decision very easily by using this Top 10 Best Convertible Crib Reviews In 2019.